that something really awful must have happened. images from the final three volumes which are still being translated. entirely unaware of why history must have needed to be re-written: repeated cometary destruction of Europe and the Mediterranean regions over the past 2000 years or more. That general ignorance is widespread and it has a powerful bearing on the 'Disclosure' issue, I think. event happens. Sorry, but I think its all wishful thinking. Why? interested the government actually is in cometary impacts. means necessary to avert such impacts. Teller, apparently, believed that the greatest threat to humankind is not nuclear war, but asteroid or comet impact. public release but formerly classified - was prepared by the U.S.
the ECO problem. Indeed, the survival of humanity is at stake. Siberia, but Moscow itself. Ten million people would have died. occur more frequently. Just such an event occurred in Brazil in 1931.
anywhere on the planet... or multiple Tunguska-size events. The technology needed to detect and deflect these 'small' high-speed objects simply does not exist. spy satellites over the course of a single decade up through 1999.
scientists and the public suggests that there is something to be hidden. CJD (mad-cow disease) is 1-in 15 million during the same lifespan. Ministry of Agriculture certainly did. Why such a strange state of schizophrenia? Perception. The people perceive that the government can do something about a disease, but can do nothing about space rocks. since strange sightings in the skies and strange beings and events historically accompany cometary events. It's as though there is some dimensional doorway-opening capacity connected to the comets/asteroids. relevance to human history. Only 10% raised their hands. all will be well if we close our eyes and minds to reality? in an instant; death that is unwelcome, terrible, and without mercy. so desperately by all of humanity. This should change! at millions of years intervals. globe uninhabitable for long periods. since 2345 BC and have continued to the present day. correlated, a true picture of our past - and future - can be had. of such are needed, desperately. experienced just such an event in 1908, as did Brazil in 1931. 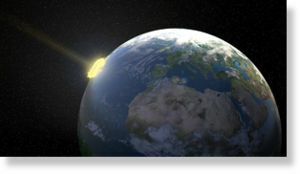 The Tunguska event produced a global scattering of iridium discovered in the Greenland ice cores. time-averaged risk of impact threat. computation equipment on the planet. This was no computer game. together. The heat generated is in excess of 5,000 degrees Celsius. - are in the same club. Will a cyanide comet hit an ocean in the future? 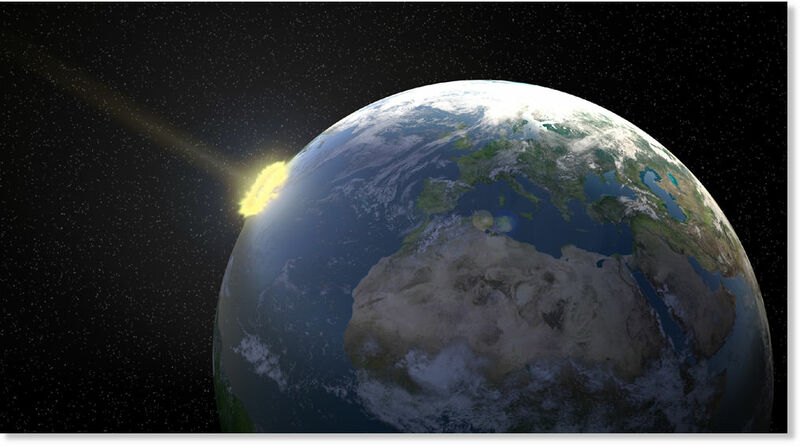 The second trumpet brings about what seems to be a meteor, comet, or other heavenly body hitting the oceans and causing the death of one-third of the world’s sea life. Most comets are made up of deadly cyanide ice compounds like cyanogen which undergoes reduction to hydrogen cyanide when mixed with water, which has an almond odor and bitter taste, and reportedly causes death at concentrations over 5 parts per million. Could a comet large enough to poison the oceans strike the earth in the foreseeable future?